Kurdpa: As part of his provincial tours, Iran’s President Hassan Rouhani arrived in Sina (Sanandaj in Persian), the capital city of one of the four Kurdish provinces in Iran Sunday morning. “Choosing Kurdistan province as the first place to visit right after the nuclear deal with the West shows the importance of Kurdistan and its people during the Islamic Revolution and their role in protecting Iran”, Rouhani told the press upon his arrival at Sina airport. 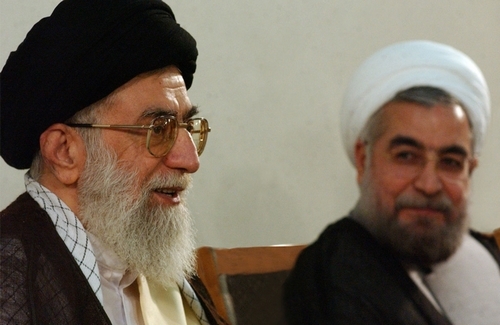 During a public speech later at a football stadium Rouhani said Iran that had strong ethnic equality. He further added that the Iranian government views Kurds, Arabs, Baluchis and Persians equally, irrespective of their religious orientations. Non-Persians in Iran have long complained that Kurdish officials are not given local posts, including a governor role. It was Rouhani’s own government who claimed it could find no qualified Kurdish candidates for any of the important posts, including the governorship. As the majority of Iran’s Kurds are Sunni, Rouhani also claimed that “Sunni and Shiite are all brothers, we are all equal”. A few days following Rouhani’s speech about ‘Sunni-Shiite brotherhood’ in the Islamic Republic of Iran, the only Sunni prayer house was ransacked in Tehran under the municipality order. According to eye-witnesses, more than 500 plainclothes attacked the building, chanting Shiite slogans. Sunni Muslims in Tehran, whose number are well above a million, are not allowed to have a Sunni mosque in the capital. On the other hand, Shiite mosques are widely built in Sunni areas. As one of the states accused of sponsoring terrorism in the region and across the globe, Rouhani also said Iran works to eradicate terrorism from the region. He added that Iran not only cares about Kurds within its own borders but also Kurds in the neighbouring regions. Masoud Barzani’s Kurdistan Democratic Party (KDP) refuted Rouhani’s claims. “In this war the Kurdistan Regional has endured substantial financial and human loss. The Peshmarga forces have defended the land and people of Kurdistan with their blood, and emerged victorious over terrorists”, read the KDP editorial on their official website. During his visit to Sina, Rouhani promised the Kurds that they would be allowed to have Kurdish language courses at state universities. Such broken promises date back to the late 1990s when the first so-called reformist President was elected. Political activists were also quick to criticize Rouhani on his visit. Hasel Daseh, a Kurdish deputy in the sixth Majlis stated in his Facebook post that Ali Younesi, Rouhani’s advisor on ethnic issues, had warned the President not to visit Kurdistan empty handed. “If Rouhani has any expedient, aside from a significant shake-ups in the Kurdish provinces, he would deliver on his promises at any cost; otherwise, the drop for his support would be over 90 per cent”, Daseh stated. Kurds in Iran complain that they have seen no improvement in their community’s situation since Rouhani became President two years ago. “The only change is that Iran is now more aware that Kurds sympathize with and relate to other Kurds across the border”, wrote Ava Homa, a Kurdish writer based in Los Angles. Kurds in Iran were very instrumental in the revolution that brought down the monarchy, only to be crushed by the new Islamic government. Kurdish political parties were forced into exile, leaving little room for political activities for Kurds and other non-Persian groups. With over 12 million Kurds are in Iran, no significant government posts are given to Kurds. Their language is banned in schools and local security and administrative officials are appointed by and from outside of the Kurdish areas.